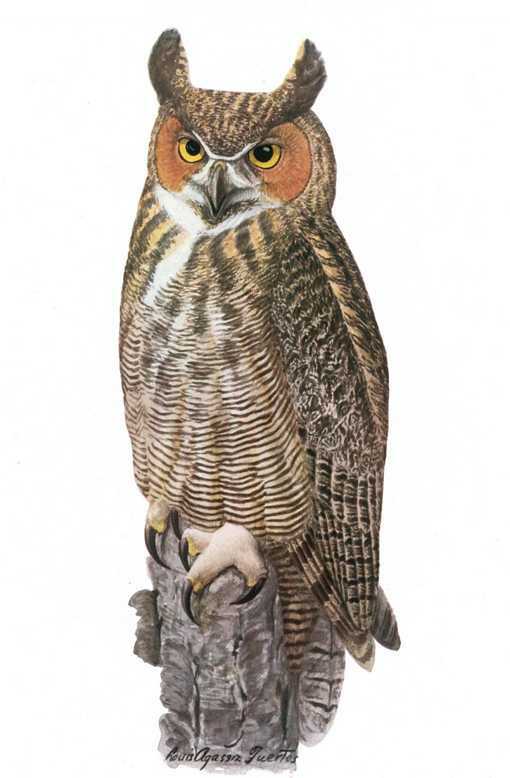 Largest North American Owl, about two feet long with a four foot or greater wing span. Barred with varying brown and gray tones mixed with white on its underside. White throat patch. Ear tufts give the illusion of horns. Long curved talons. Large intimidating yellow and black forward facing eyes are immovable. It must turn its head so much it seems it might twist off. Inhabits woodlands, scattered groves in open ranges, deserts, high mountain plateaus, canyons, farms, or even towns from as far north as there are trees in Alaska and Canada, and throughout North and Central America, to the Straits of Magellan at the southern tip of South America. Its night vision, keen hearing, and swift silent flight make dusk to dawn the ideal time for great horned owls to hunt totally unsuspecting prey. Feeds on rodents, small mammals, poultry, game birds and song birds, the bones, fur and feathers of which adorn their nests and the ground below. Also eats water foul, fish, even skunks. Robs ospreys of fish and sometimes makes the mistake of attacking a porcupine. Great Horned Owls are so bold many are injured or killed attacking prey. You’ve may have seen flocks of crows, magpies, or noisy songbirds chasing hawks or owls. Annoying mobs are the smaller species’ only defense against these predators. A hawk will usually fly while a Great Horned Owl will often perch pretending to be indifferent until it finally has had enough. You can fairly easily observe the bird in its natural habitat, or from around a campfire, which they seem to be attracted to, especially since they are almost everywhere. Its observant appearance and success as a hunter give it a reputation of being wise. Its deep eerie hoots give it a place in superstitious folklore, and its blood curdling scream can only be fully appreciated deep in a forest, after dark, alone. Often claims other hawk, eagle, or crow nests, builds nests high in trees (as high as 100 feet) of sticks, twigs, bark and feathers in cavities, or cliff ledges which are normally abandoned after one brood season. Usually remains within a few miles of its nest year around. Lays two or three dull white eggs which hatch after about a month of incubation and young remain in the nest for about another two months. 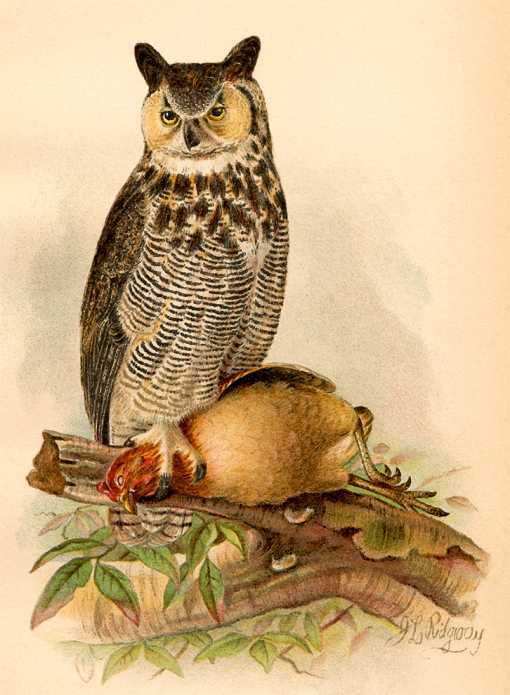 Largest North American Owl, about two feet long with a four foot or greater wing span. Barred with varying brown and gray tones mixed with white on its underside. White throat patch. Ear tufts give the illusion of horns. Long curved talons. Large intimidating yellow and black forward facing eyes are immovable. It must turn its head so much it seems it might twist off.